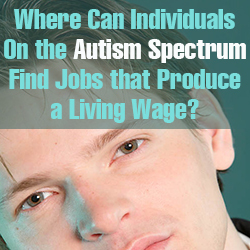 Where Can Individuals On the Autism Spectrum Find Jobs that Produce a Living Wage? The search for a living wage is not unique to individuals on the autism spectrum nor is it a new phenomenon. Norlund (1997) in his book, The Quest for a Living Wage: The History of the Federal Minimum Wage Program noted that at the turn of the 20th century “anti-sweating agitation” led to the passage of minimum wage laws in Australia, England, and the United States. Sweating was defined as “The payment by an employer to his work people of a wage which is insufficient to purchase them the necessities of life. These include food, housing, clothing, and the like, needed to maintain life on a sustained basis” (as cited in Ayers, 1997; p. 40). The enactment of National Industrial Recovery Act in 1932 as a part of Roosevelt’s New Deal led to the creation of a Fair Labor Standards Board and conferences on a minimum wage. During this time period the minimum wage was set at $.40 an hour and was not to exceed $.80 an hour or $1,200 annually. The work week was limited to 40 hours a week and “oppressive” child labor was strictly regulated. By 1938 the Fair Labor Standards Act (FSLA) was signed into law. This law created advisory boards that recommended hourly wages by profession as well as setting the number of hours to be worked. Post World War II and the Korean War the minimum wage set by the government did not keep up with the pay scales in industry. Once again the lowest paid workers were struggling to earn a living wage. In 1961 President Kennedy raised the minimum wage from $1.00 an hour to $1.25 an hour. He also signed an amendment to FSLA known as the Equal Pay Act that prohibited employers from paying employees differently based upon their gender (Ayers, 1997). No provisions in the Act were written to prevent discrimination in pay based upon disability status. This was not even in the consciousness of the country at the time. What about today? What are the conditions facing the lowest paid employees? Are they able to make a living wage? According to the U.S. Department of Labor Bureau of Labor Statistics (BLS); “In 2012, 75.3 million workers in the United States age 16 and over were paid at hourly rates, representing 59.0 percent of all wage and salary workers. 1 Among those paid by the hour, 1.6 million earned exactly the prevailing federal minimum wage of $7.25 per hour. About 2.0 million had wages below the federal minimum.2 Together, these 3.6 million workers with wages at or below the federal minimum made up 4.7 percent of all hourly paid workers” (2013). Although workers who were less than 25 years old made up about 1/5 of the hourly workforce they represented over 50% of the employees who made the federal minimum wage or less. Never married workers were 4 times more likely to earn the federal minimum wage or less. Gender was also a significant factor. Women were 2 times more likely to be earning the federal minimum wage or less. Education also contributed to the likelihood an individual earned the minimum wage or less- “Among hourly paid workers age 16 and over, about 10 percent of those who had less than a high school diploma earned the federal minimum wage or less, compared with about 4 percent of those who had a high school diploma (with no college) and about 2 percent of college graduates” (BLS, 2013). The type of occupation also predicted the likelihood that an employee received a minimum wage salary or less. Individuals in the service industry, particularly food service made up 12% of the individuals earning the federal minimum wage or less. Recent efforts by labor organizers have targeted fast food chains for paying their employees less than a living wage and have argued that the federal minimum wage should be raised to $15 an hour. What about individuals with disabilities? How likely are they to receive the federal minimum wage or less? We know that individuals with disabilities in general are twice as likely to be unemployed than the non-disabled population. If we look more closely at the autism population, then the numbers are grimmer. At best the unemployment rate is 45%. Anecdotal evidence suggests the unemployment rate among individuals with autism may exceed 90%. Of those who are employed, many are under employed in terms of challenging work and are only working part-time. Among the general population part-time status is a predictor of earning the federal minimum wage or less. “About 11 percent of part-time workers (persons who usually work less than 35 hours per week) were paid the federal minimum wage or less, compared with about 2 percent of full-time workers” (BLS, 2013). No comprehensive data are collected by the federal government on the employment trends of individuals with disabilities in general and autism in particular. Only recently has the federal government collected employment data on people with disabilities as a group. The data appear to be a gross under-estimate of the unemployment situation facing these workers. The Obama Administration; however, has recognized that some individuals with disabilities working in sheltered workshop settings were being exploited and paid far less than the federal minimum wage. The Administration has brought lawsuits in a number of states against employers using this practice. We know that education and training make a substantial difference in employment for people in general and especially for people with disabilities. For individuals with disabilities, those that earn a bachelor degree are hired at rate that is about the same as their non-disabled peers. However, not every individual on the autism spectrum is interested or able to earn a 4 year liberal arts degree. Associate degrees offer a more direct connection between what is taught in the classroom and an occupation. The 2 year curriculum is more manageable for many of these students. Possessing an associate degree will be the “sweet spot” in the economy over the next 4 years. There is an expected growth of more than 18% in the number of jobs requiring an associate degree (BLS, 2011). In fact, there is expected to be more job openings requiring an associate degree than potential employees who hold that degree. Jobs requiring a post-secondary vocational certificate will see a 13% growth in job openings over the same time period (BLS, 2011). New York Institute of Technology Vocational Independence Program (VIP) created a number of programs in response to the growing trends in the U.S. economy. VIP created the Associate Degree Support Program for higher functioning individuals on the autism spectrum so that they may complete an associate degree in the span of 3 years rather than the traditional 2 years. Students in this program have a high number of individualized supports that even exceeds what is offered by the college through the office of disability services. Recognizing both the labor trends and the strengths of individuals on the autism spectrum, the two associate degree programs are in: (1) business administration with an emphasis in accounting; and (2) communication arts with a focus on blogging and web design. Both of these degrees lead to jobs where the students can earn a living wage. A person earning an associate degree is expected to earn $1.8 million over the course of his or her working life (Julian, 2012). This is double the amount an individual will earn if they do not complete high school which is $900,000 (Julian, 2012). Individuals with an associate degree in business administration with an emphasis in accounting will be looking for jobs in the book keeping, auditing and accounting fields. Entry level positions in this field only require a high school diploma and earned a median income of $35,170 in 2012 (BLS, 2014b). Bachelor degree level accountants earned a median income of $55,000 to $74, 999 over the same time period (BLS, 2014a). Associate degree level employees can expect to earn between $35,000 and $55,000 on an annual basis depending upon experience and geographical region. Whereas an individual possessing an associate degree in communication arts that is looking into a web development job may have a median income between $55,000 to $74,999 (BLS, 2014) or a desktop publishing position that earns a median income between $35,000 to $54,999 (BLS, 2014). Not all higher functioning individuals on the autism spectrum have the interest or the aptitude to pursue an associate degree. These students may be good candidates for a post-secondary vocational certificate. Given that many individuals with autism are interested in computers, New York Institute of Technology Vocational Independence Program partnered with e-Works™ Electronic Services Incorporated to create three certificate programs in computer auditing, de-manufacturing, and materials handling. E-works™ mission is to employ people with developmental disabilities. “e-Works achieves this mission by providing competitive recycling, refurbishment and resale services of all types of office and industrial technologies and consumer electronics” (e-works, 2013). This is a part of a growing industry known as green goods and services. The re-cycling of electronics is a part of the industry referred to as e-waste recycling which the Environmental Protection Agency identifies as the fastest growing waste stream in the U.S. The potential for employment at a living wage in the green goods and services industry is huge. Americans throw away 80-85% of their electronic devices (Do Something.org, 2014). By volume this e-waste only accounts for 2% of landfill, but it represents 70% of our nation’s toxic waste (Do Something.org, 2014). Each and every community in the United States will need to address the handling of e-waste. Materials handlers in the traditional recycling industry required the lowest level of education and training. Consequently, they made the lowest median income in 2010 which was $23,570 (BLS, 2014c). De-manufacturers in the e-waste industry are akin to employees known as assemblers or fabricators in manufacturing which earned a median income of $28,580 in 2012 (BLS, 2014d). However, de-manufacturers have a specialized skill set which may make their salaries comparable to computer and office machinery repair persons whose median income was $38,310 in 2013 (BLS, 2014e). Computer auditors require the highest level of skills which could include not only a post-secondary vocational certificate, but could also include an associate degree. These individuals will assess an electronic device to determine if it can be refurbished and re-sold or donated; specific parts only can be refurbished and re-sold; or if the entire device must be completely disassembled and all of its parts re-cycled. Although the Bureau of Labor Statistics does not track this job title specifically it does track the job title of Electro-mechanics which have similar duties and skills sets to that of computer auditors. In 2012 the median income of Electro-mechanics was $51,580 (BLS, 2014f). Individuals on the autism spectrum can earn a living wage provided they receive the proper degrees and/ or post-secondary vocational training. Fields involving computers hold great promise for employment because they play to individuals on the autism spectrums’ strengths, interests, and aptitudes. Jobs in the green goods and services industry hold the most promise for growth in jobs that can provide a living wage for individuals with autism while providing society with a badly needed service through the safe and responsible handling of our discarded electronics. Ayers, M.E. (1997). Review of the Book Christopher Norlund. The Quest for a Living Wage: The History of the Federal Minimum Wage Program. Monthly Labor Review December 1997. Pp. 40-41. Do Something.org (2014). 11 Facts about e-Waste. Retrieved from: https://www.dosomething.org/facts/11-facts-about-e-waste July 22, 2014.
e-Works ESI (2013). The e-Works Mission. Retrieved from http://www.eworksesi.org/mission.html August 15, 2014. Julian, T. (2012, October). Work-life earnings by field of degree and occupation for people with a Bachelor’s degree: 2011. American Community Survey Briefs. U.S. Department of Labor, Bureau of Labor Statistics. U.S. Bureau of Labor Statistics (2014c). Occupational Outlook Handbook. Retrieved from http://www.bls.gov/green/recycling/#sorters August 15, 2014. U.S. Bureau of Labor Statistics (2014d). Occupational Outlook Handbook. Retrieved from http://www.bls.gov/ooh/production/print/assemblers-and-fabricators.htm August 15, 2014. U.S. Bureau of Labor Statistics (2014e). Occupational Outlook Handbook. Retrieved from http://www.bls.gov/oes/current/oes492011.htm August 15, 2014. U.S. Bureau of Labor Statistics (2014f). Occupational Outlook Handbook. Retrieved from http://www.bls.gov/ooh/architecture-and-engineering/print/electro-mechanical-technicians.htm August 15, 2014.